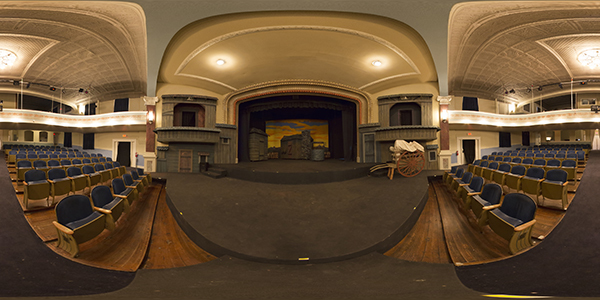 This immersive panorama was taken during the rehearsals for the production of Fiddler On The Roof. This panorama was produced using a tripod, a levelling platform and a pano head. Each image is composed of 7 bracketed shots from 1/250 sec to 9 secs. There are 10 images: 6 at 0°, 2 orthogonally at +60° and 2 off tripod orthogonally at roughly -90°. The images were then stitched using Hugin and then transformed into a multi-resolution panorama with KRPano.